Bengaluru-based Wickedride Adventure Services Pvt. Ltd, which runs online motorbike and scooter rental firm Metro Bikes, has raised $12.2 million (Rs 83.6 crore) in a round co-led by Sequoia Capital India and Accel Partners, a company statement said. The company has rebranded itself from Metro Bikes to Bounce. The rebranded venture will offer a dockless scooter sharing service allowing users to pick up the two-wheeler from anywhere, ride to their destination and drop it off at any location, the statement added. “There is tremendous potential for innovation in the shared mobility segment given the major gap in last-mile connectivity in intra-city travel. We are looking at a market opportunity of $4.5 billion,” Vivekanand Hallekere, co-founder of the venture, stated. The company hopes to expand its services to all the major cities by 2020. Besides scooters, it also offers bicycles, pedelecs and kick scooters on rent, Hallekere added. The average cost per kilometre is as low as Rs 6 for a Bounce user. The company has seen over two lakh downloads on its Android and iOS platforms, it said in the statement. The funding announcement comes less than two months after TechCircle had reported that the firm had raised Rs 62.13 crore (around $9.1 million at current exchange rates) from Sequoia Capital India and Accel Partners. Raghunandan Gangappa, the co-founder of ride-hailing firm TaxiForSure, had also participated in that round. Ballpark estimates by TechCircle show that the latest round will value the company between $20 million and $22 million (Rs 137 crore and Rs 157 crore). In February this year, the family investment office of Sutures India chairman Chandrasekhar Gopalan had invested $1.5 million (Rs 10 crore) into the venture. In June, The Economic Times had reported that Omidyar Network and Hero Group’s Sunil Munjal were in advanced talks to separately invest in Metro Bikes. 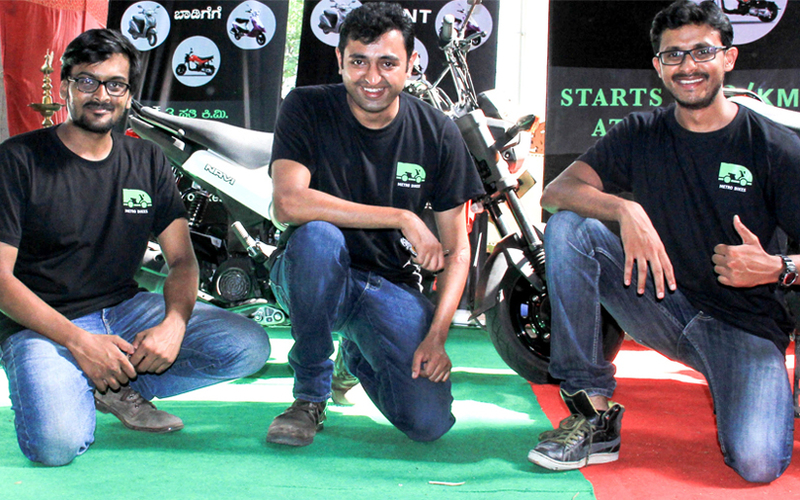 The two-wheeler rental firm was started in 2014 by Hallekere along with Arun Agni and Anil G. The company operates two different entities for its online bike and scooter rental ventures. Bounce (earlier Metro Bikes) offers not only dockless scooter sharing services but also gives bikes on rent. This arm primarily focuses on urban commutation and last-mile connectivity. It also offers a monthly subscription-based plan where a user can pick a bike or scooter from a metro station, take it home and drop it back there the next morning, information on the company’s website states. However, TechCircle noticed that the company’s website still functions with the earlier brand name metrobikes.in. Besides Bounce, the company also operates WickedRide, which is the premium motorbike rental platform, where users can rent from a fleet which includes brands such as Harley Davidson, Benelli, Royal Enfield, Kawasaki, Triumph, Ducati, KTM and Americana. Users can rent the bike on an hourly, weekly and monthly basis. The service is available across more than 10 locations including Bengaluru, Mysore, Jaipur, Manipal, Ahmedabad, Gokarna and even New Zealand, according to information available on WickedRide’s website. A few ventures in the broader online vehicle rental space have raised funding in recent months. In April, the parent of online scooter rental platform Vogo raised $7 million (Rs 45.5 crore) in funding led by homegrown ride-hailing major Ola. Venture capital firms Stellaris Venture Partners and Matrix Partners also put money into Bengaluru-based Vogo Automotive Pvt. Ltd. In February this year, car rental startup Zoomcar raised $27.6 million (Rs 176 crore) from automotive major Mahindra & Mahindra Ltd as part of a $40-million Series C round. In January this year, Bengaluru-based self-riding bike rental company Ontrack raised an undisclosed amount in seed investment from Diverse Middle East FZE, a Dubai-based family office, and others.